The 2013 Poky Pedals have come and gone. Before we set our sights on next year, this is a good time to remember the Bike Fun we shared during the second season for Poky Pedaling Stevens Point. Is it art? Or is it Bike Fun? 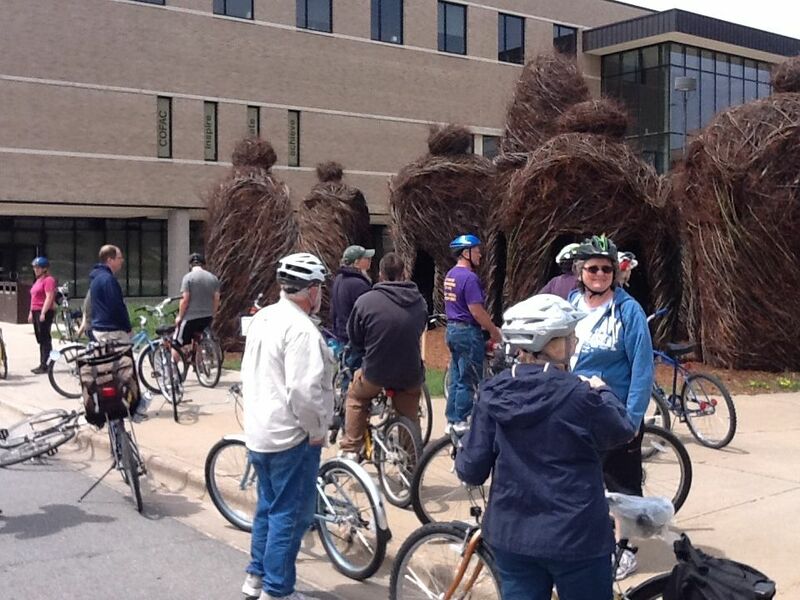 Poky Pedalers shared Bike Fun on 10 Poky Pedals in 2013. All were new except for the encore for “Whatever Happened to Mosey Creek?” Each ride averaged over 13 Poky Pedalers, and our numbers thrice hit 20 as we rode on calm streets and non-motorized paths throughout our urban area. As for where we rode, we pretty much covered the city of Stevens Point and then some. We rode areas west of the Wisconsin River, east of I-39, and north of Sentry Insurance headquarters. One ride started in Plover, during which we circumnavigated Springville Pond. Plover and Whiting have some excellent streets for urban bicycling, and you can expect more Bike Fun in the urban regions south of Stevens Point next year. Local history was again a prominent theme in our Bike Fun. 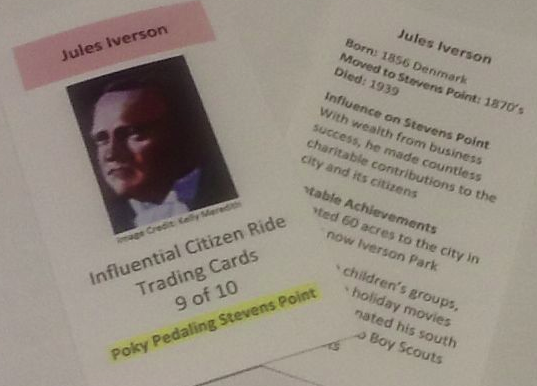 On the Influential Citizen Ride, we visited locations named after prominent citizens from Stevens Point’s past and learned about their influence upon our city. The “Whatever Happened to Mosey Creek?” ride once again told the story of the infamous creek responsible for local flooding throughout the existence of Stevens Point, even in recent times. 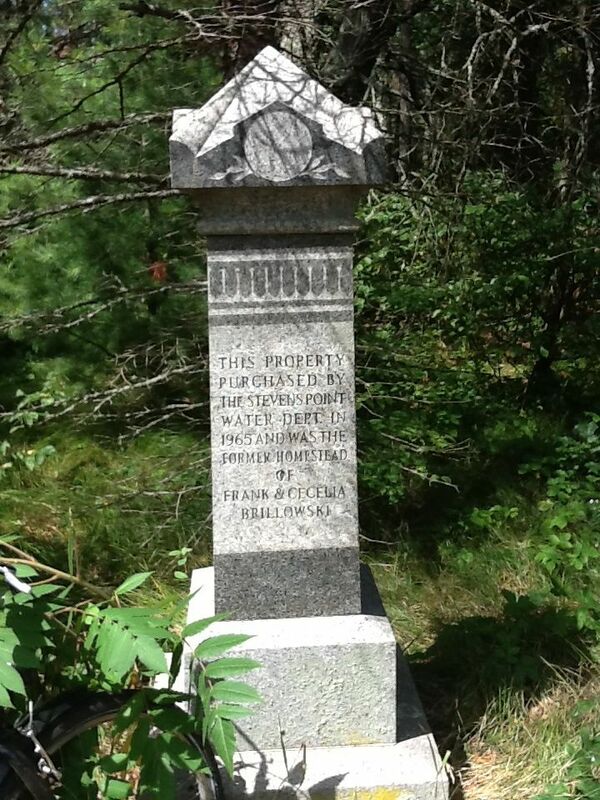 We learned the little-known story behind the two-‘L’ Brillowski stone marker hiding in plain view on one-‘L’ Brilowski Rd. We visited the former Central City Iron Works while looking at an 1892 picture of it – that building is better known to those who have been around for a while as The Cow Shop, the former Altenburg Dairy. and ringing our bike bells at every ornamental water well we encountered in Plover. 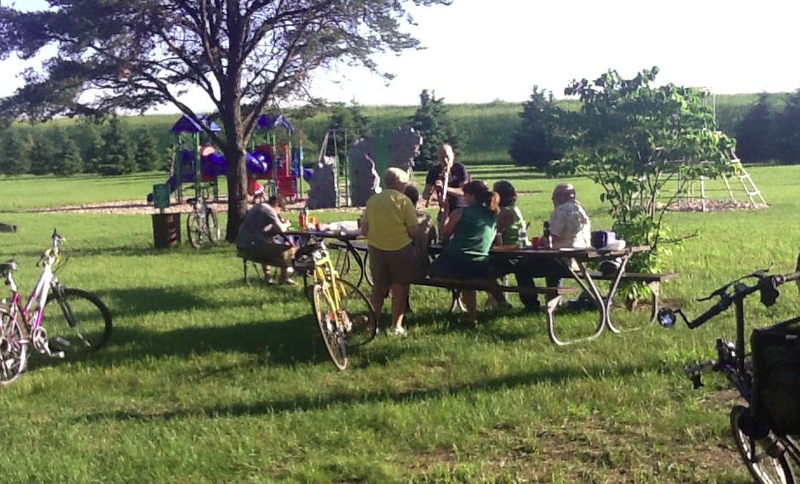 We enjoyed 4 Poky Pedaling Potluck Picnics during 2013. These again brought Poky Pedalers together to enjoy a wide assortment of delicious food in mystery park locations around our urban area. These locations included a Town of Hull park east of the interstate, a comfortable shelter in Schmeeckle Reserve to guard against the threat of rain, and a triangle park among the neighborhoods east of UWSP. If you want greater detail to more fully relive the past year of Poky Pedals, visit the 2013 Bike Fun Calendar page for the full set of links to all the Bike Fun reports. You can find it under Poky Pedals on the menu bar. Looking ahead to next year, I continue working on the 2014 Bike Fun Calendar. You can expect around 10 Poky Pedals with the usual mix of history, whimsy, and scenery. The Poky Pedaling Potluck Picnics will again take us to mystery parks around the city where we will share scrumptious feasts. Bike Fun with PPSP will start in May, and it will end in October with the Maple Ride, seeking out streets named ‘Maple’ in yet another new area. Look for the 2014 Bike Fun Calendar on the PPSP website in early April. I’m looking forward to next year’s Bike Fun. 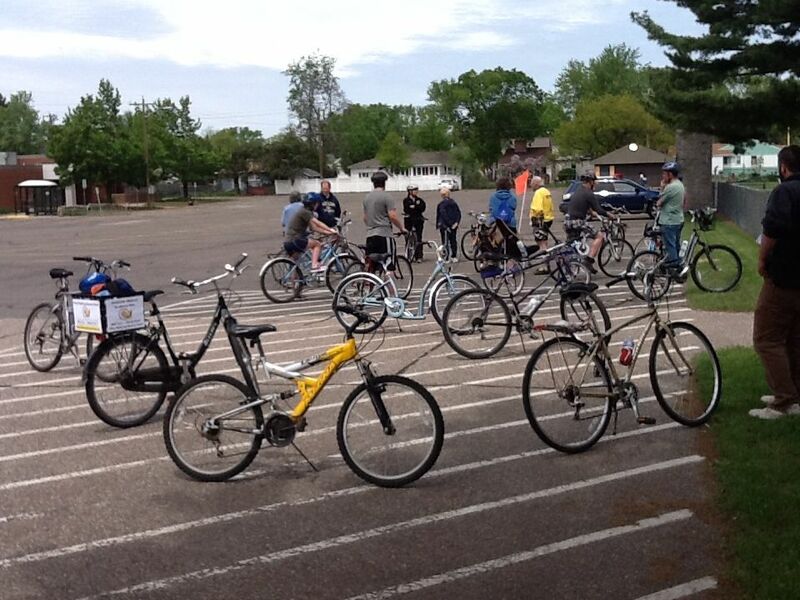 Between now and then, there are lots of bikey things happening in Stevens Point. Check out the PPSP blog regularly to keep up to date on all the local bicycle news. Before you know it, we’ll all be sharing Bike Fun again.